First Line: The noise and heat from the crowd rose toward the ceiling and mixed with cigarette smoke in a thick smog around the chandeliers. When Detective Inspector Irene Huss of the Violent Crimes Unit in Göteborg, Sweden, begins to investigate the missing persons case of Sophie Malmborg, she finds herself thinking of the first time she met the young girl. Fifteen years before, Huss was on her first big case. Sophie's stepfather died in a house fire, and although a few people suspected that the strange little girl had set fire to her own house, nothing was ever proved. Huss was told to move on to more pressing cases, but she'd always believed that she'd let Sophie-- and herself-- down. Sophie went on to become a talented ballet dancer. Too tall to dance professionally, Sophie had turned to choreography, and her work The Fire Dance was to premiere. But now she's missing, and the charred remains of a dancer have been found in an abandoned warehouse. Huss can't help but think that the old case she wasn't allowed to solve is tied to this newest one. Once again Helene Tursten has crafted a story in which the personal relationships of the characters blend seamlessly with the police investigation. 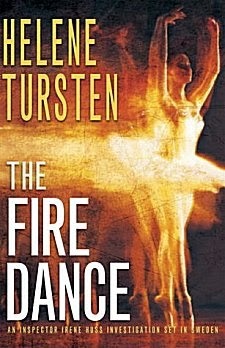 The Fire Dance allows us to see Huss as a police officer who's still finding her way through the political dynamics of her job, and as a new wife and mother as well. The new perspective adds depth to the story, as does the cold case. Sophie Malmborg is one of the most interesting characters I've come across in a long time: prickly, almost totally uncommunicative, she sees life through the prism of her passion for dance, and she refuses to bow to anyone else's demands that she change. A reader can't help but want to know what makes her tick. Although we get an honest picture of why it can take so long to solve a crime in any large city, Huss's family life still plays an important role in the book. Her twin daughters are both about to fly the nest, and her husband is still Irene's rock. Between a heavy caseload and two girls willfully expressing their independence, Irene definitely needs a devoted and loving husband like Krister. For the first time in this series (I've read all the books as they've been translated into English), I felt let down by the solution to the crime. It was just way too obvious to me and took away some of my enjoyment of the book. Is The Fire Dance still good? You bet it is, especially due to the strong cast of characters Tursten has created-- and those characters have more than one surprise in store for readers like me who have followed this series from the start. Cathy - I like this series very, very much, and one of the reasons I do is exactly the point you make here. Tursten does such a good job of blending the cops' personal lives with the cases they investigate. I'm sorry to hear the end let you down a bit, but this one is staying on my TBR.